Jenny of ELEFANTZ: Show and Tell - the first for 2012! Show and Tell - the first for 2012! On our Australian shores 2011 has passed and 2012 has awoken. I wonder what this year will have in store? To start the year on my blog I am going to share some photos I've been sent of projects others have made from my designs. This is definitely a fun side to my work! My good friend Fiona over in WA made my "Love is all you need.." cushion from a kit I made up for her. It was a gift for her mum over in New Zealand. Isn't it gorgeous!? 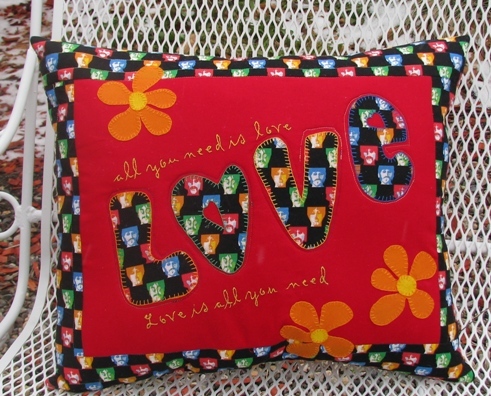 Andra made my "All you need it love..." wall hanging into a cushion - this is a funky one, and I love it!! 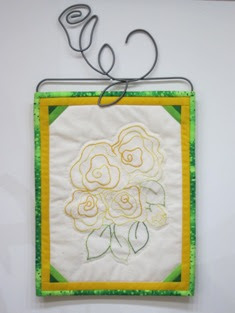 Sherry used the free blocks I shared in 2010 to make a beautifully 'classy' wallhanging - again, look at that perfect hanger! Ladies, all of these are so pretty, and you have made me blush that you enjoy making my designs so much! Wow! They're all beautiful, and those are some wonderful hangers. I still have to finish up a couple of the Give Thanks stitcheries, but 2012 is going to be a year of finishes, and they're near the top of the list. Happy New Year! Happy New Year, sweet Jenny!! Wow I love all the projects - and those hangers are wonderful! They are all gorgeous. Happy New Year to you too. 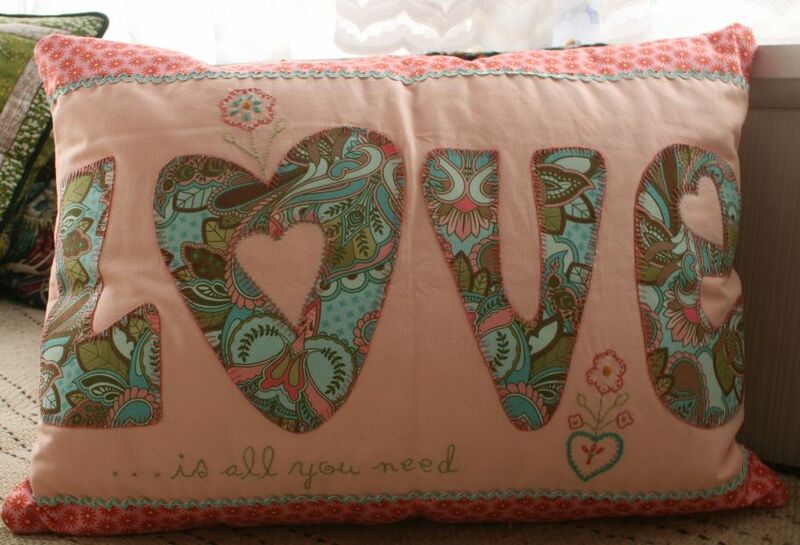 Great fun to see my pillow on your site! It is only 10PM here and we are starting our New Year's Celebration. Happy New Year! I love those pillows! Happy New Year my beautiful friend. May 2012 be a blessed one for you and your family. Thanks for sending me the kit for the cushion ~ it was such a pleasure to stitch. Next stop - hand-stitching a dolly with Miss B! What beautiful projects. It must be lovely to see your ideas being interpreted by others. Congratulations! Happy 2012. Deseo que este año que recién inicia, venga lleno de amor, paz, salud y bendiciones, y que la luz del Señor ilumine su hogar, la felicito por sus maravillosos trabajos. Les deseo un muy FELIZ AÑO. I finally finished stitching the elephant. I am making her into a pillow for my daughter. When it's done, I will send a pic. Yesterday I picked out the fabrics to make the Love pillow. I can't wait to start it later today. Thank you for sharing your designs with us Jenny. You are so creative. I want to say Thank you for the Give Thanks stitcheries. I used them as a gift for my dear husbands 60 birthday. I even used them in my speech when celebrating his day(and mine - I was 60 too). We live in Norway so I translated the verses, and my heading says: Thank you Good: That is just what we feel after 37 years of marriage. I look forward to your new free BOM! !